When I click on "Stats" my cheat engine crashes. Don't know what that's about..
Actually, nothing really enables after i enable "bloodybone" and "player". CE just stops responding. It works for me so that's weird. 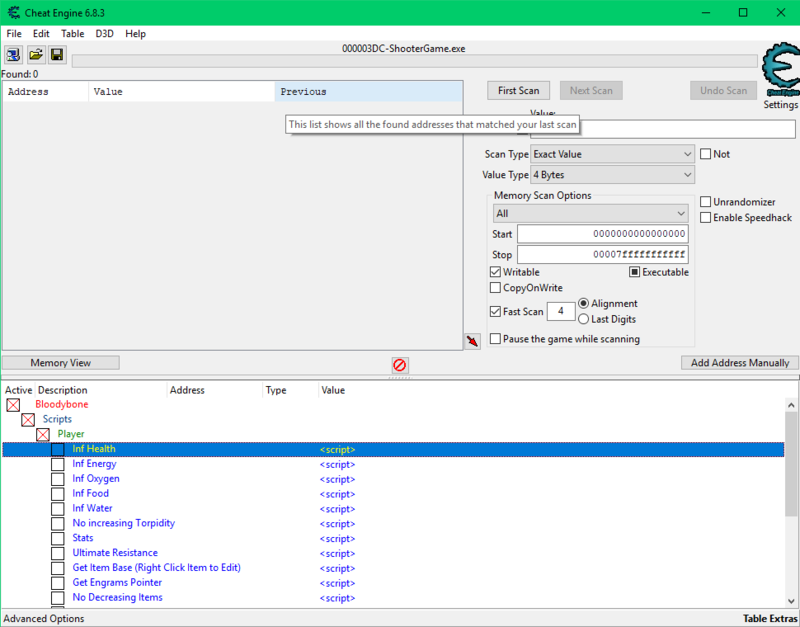 Does Cheat Engine show like No Response because cheat engine takes some time loading all the Symbols and activating a script before that makes Cheat Engine not respond until all symbols are loaded. It freezes immediately after i click on anything. So idk. If I click on "bloodybone' and " player" it loads quick. its good until i click on one of the cheats. wait, its working again... weird. Yeah, cheat engine needs some time loading all the symbols..
P.S. Your table is the best, it does more than other table or trainer! Sorry that It took me so long to update the table but I at least added a script which gets the PlayerController, PlayerCharacter and the MovementComponent of the Player with which you may be able to find interesting variables. For Example using the MovementComponent i found the Players Position. Hey. I'm trying but when I tried to active something seems like nothing happens on cheat engine (not check mark or process running). Any ideas? Not working at all. I cant check any option. Do I have to run something else before check an option? Well, now I'm at ShooterGame.exe process and still happen the same. When I try to click on a checkbox still do nothing.